IF I COULD ONLY EXPRESS THE EXCITEMENT FOR THE NEW BRAINS IMPLANTED IN LOUISE. AND IF YOU COULD ONLY WITNESS THE NEW TECHNOLOGY THAT HAS INSTANTLY BECOME OUR NEW BEST FRIEND. WOW. WE LOVE YOU SIMRAD. This long skinny black device has been mounted in our cockpit. 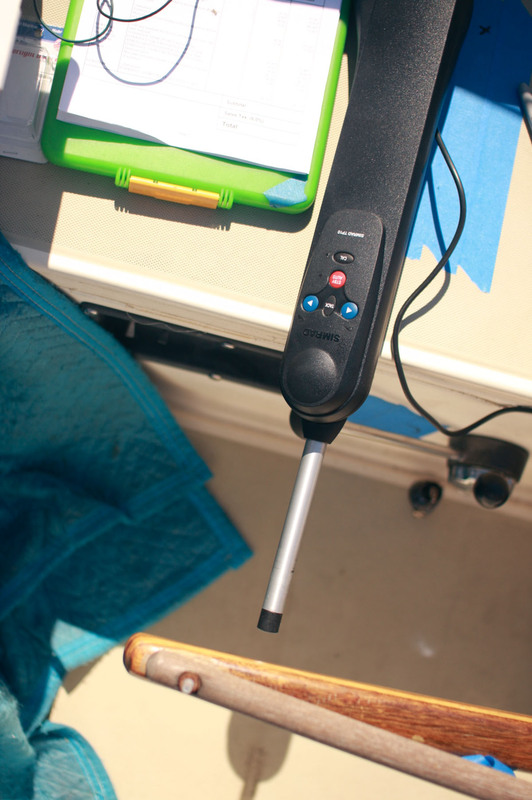 It has an arm that pushes and pulls our tiller in a direction we tell it. 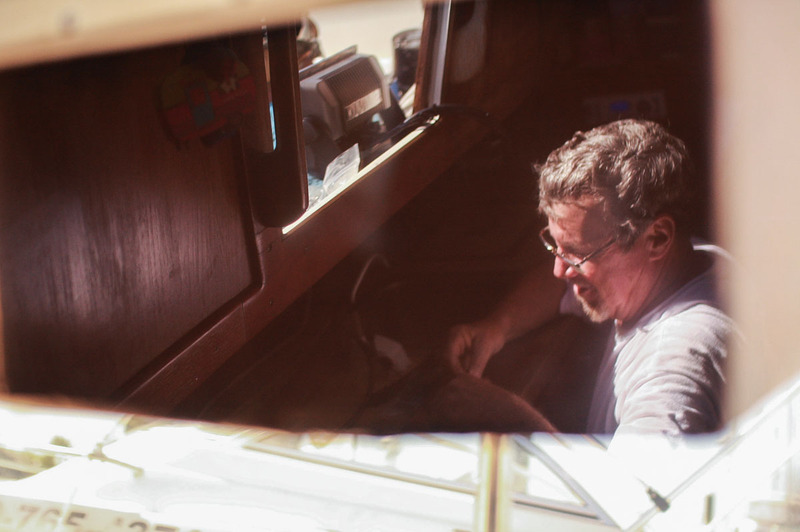 It is our new appendage, our new right hand, a new crew member aboard Louise. An auto-pilot my friends. A truly beautiful thing. We will have a name for her shortly, don’t fret. And a television like screen mounted on a bracket with a rotating arm that freely swings from the kitchen to the patio (from inside the galley to outside in the cockpit.) A high definition, multi-functioning, color touchscreen which will guide us through channels, around sunken ships, coral reefs, and underwater obstructions – we hope. A brand-new chart plotter my friends. She too, will not go unnamed. 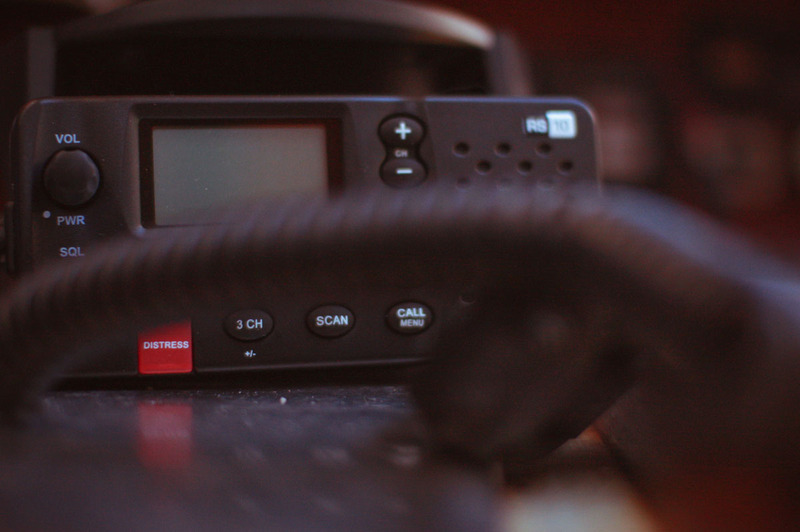 A new VHF, allowing for clear communication between us and other boats. 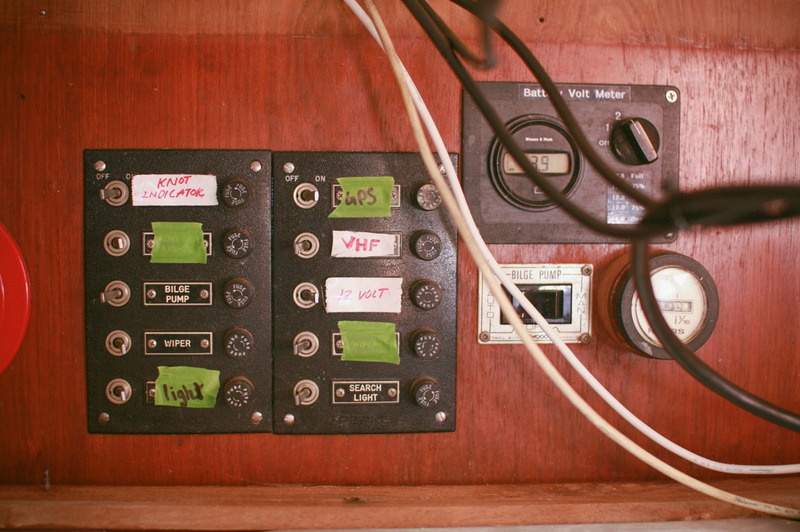 An instrument panel mounted in the cockpit in place of the original knot indicator that ALWAYS informed us we were going 6 knots, even when we weren’t. Last but not least, Louise will get hauled out of the water to have a new transducer installed at the bottom/front area of our keel – where it’s purpose is intended. 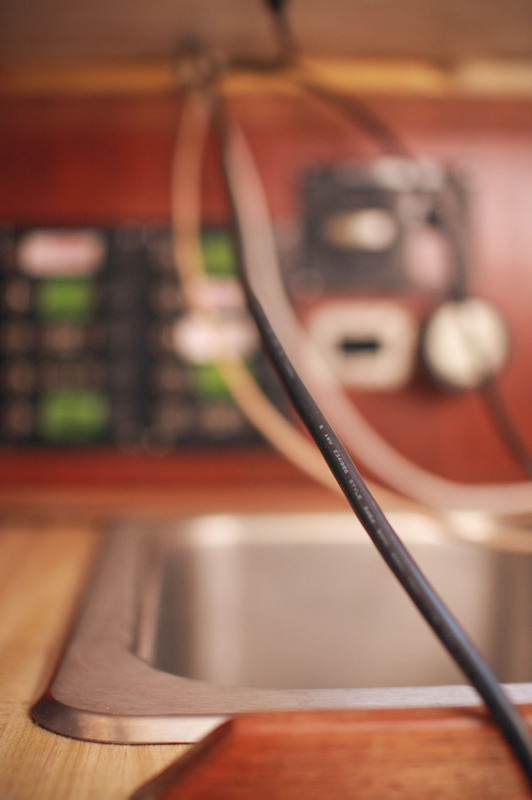 The “backbone” also known as NMEA 2K is our new electrical wiring that interconnects all of these electronics so they can communicate. Kind of like how iCloud allows your iphone/ipad/macbook to share information in your home. This magical new connection in Louise’s brain is about to make our travels extraordinary. I am not trying to make this such a dramatic story, we are just seriously excited. 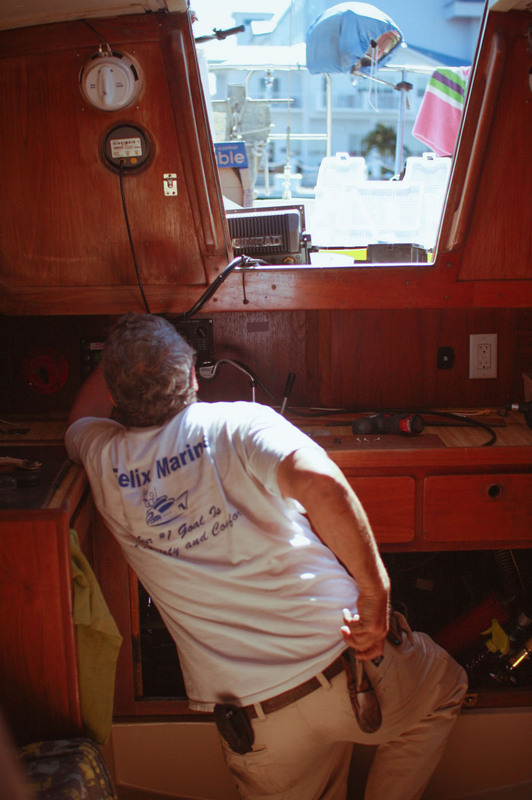 The guys from Felix Marine and Simrad have no idea how this installation is about to change our life. They did such an amazing job working on Louise, crawling in and out of her basement, while placing everything not only conveniently, but also aesthetically. Kind, knowledgable, and resourceful, it has been a pleasure to get to know these guys. Katie and I have a lot of learning to do with our new toys. I could talk about them for hours. I assure you you will continuously read about them in our travels from here on out. We can not express how thankful and ecstatic we are for the new additions… stay tuned on how funny it is going to be as we learn the ins and outs. (Back in Illinois, we were traveling the river shortly behind our German friend, he is single-handed with an auto-pilot set up. He went below to take care of some business, at the same time, his auto-pilot took a 90 degree left turn, straight into the river bank. Cruising at 6 or 7 knots with the rivers current, I have never seen a boat run aground so abruptly. This ended up being the highlight of our day because nothing was damaged and he got pulled off the bottom. Quirks like these in auto-pilots frighten me, but i’m pretty sure Simrad would never play such a nasty trick on us) This is the first of many Simrad related posts. 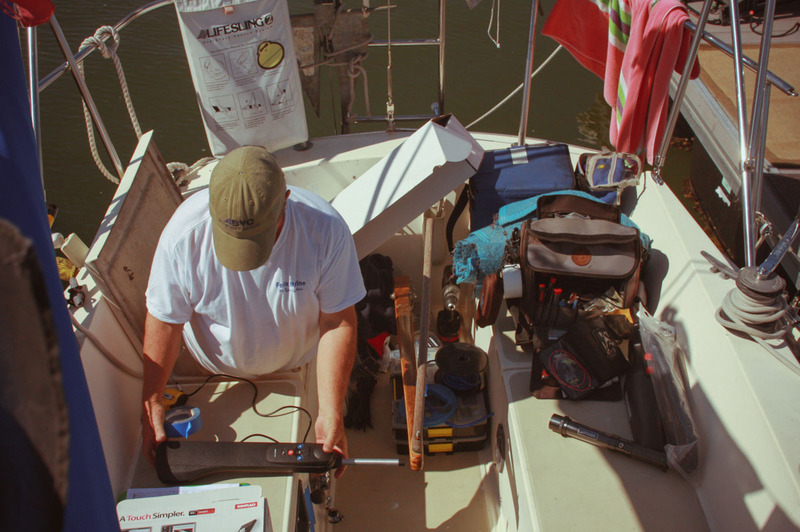 More pictures and videos of Simrad items in action in the near future. This stuff will make all you boaters out there turn in the old for the new! Thank you again to the brave men who risked their lives aboard Louise to support Katie and Jessie on a boat. We call ours ‘Auto’ however yours definitely needs a sweeter name than that…maybe Simthia 😉 Love watching your trip. Way to go! Wow ! you two are wired!! 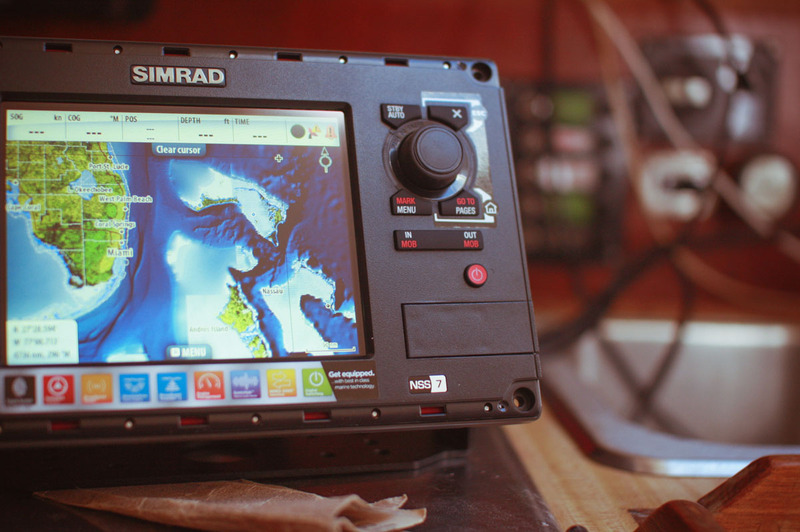 Keep us readers tuned as to how you like Simrad. Jessie & Katie – wow, so you two are off once again, cool. neat. exciting! loved the pics of your dad from the Desiree trip. I think when he did the first trip, neither he nor Curt thought to bring a camera…too bad. Can’t wait to see what the Bahamas are like, and where ever else it is that the two of you and Reggie will be visiting. oh, very smart to get all that navigation equipment. as for those auto-pilot things I only like them when you are returning back from a long distance race and most folks are sleeping down below, but always someone should be up on deck. geez, I would never leave the tiller un-watched, unless I was in a single-handed race, and for those they have lots more pricey auto-pilot rigs. have fun & bon voyage! I think Sinbad would be a great name!